74 THE SHOP NOVEMBER 2018 SKETCHBOOK PROJECT VEHICLE HYUNDAI IONIQ Neil Tjin and Tjin Edition in Laguna Niguel, California, present the Tjin Edition Hyundai Ioniq project featuring a custom Avery Dennison wrap installed by the team at Daley Visual. 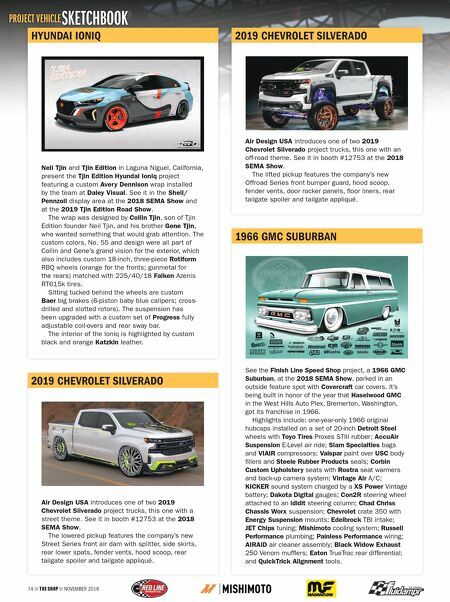 See it in the Shell/ Pennzoil display area at the 2018 SEMA Show and at the 2019 Tjin Edition Road Show. The wrap was designed by Collin Tjin, son of Tjin Edition founder Neil Tjin, and his brother Gene Tjin, who wanted something that would grab attention. The custom colors, No. 55 and design were all part of Collin and Gene's grand vision for the exterior, which also includes custom 18-inch, three-piece Rotiform RBQ wheels (orange for the fronts; gunmetal for the rears) matched with 225/40/18 Falken Azenis RT615k tires. Sitting tucked behind the wheels are custom Baer big brakes (6-piston baby blue calipers; cross- drilled and slotted rotors). The suspension has been upgraded with a custom set of Progress fully adjustable coil-overs and rear sway bar. The interior of the Ioniq is highlighted by custom black and orange Katzkin leather. 1966 GMC SUBURBAN See the Finish Line Speed Shop project, a 1966 GMC Suburban, at the 2018 SEMA Show, parked in an outside feature spot with Covercraft car covers. It's being built in honor of the year that Haselwood GMC in the West Hills Auto Plex, Bremerton, Washington, got its franchise in 1966. Highlights include: one-year-only 1966 original hubcaps installed on a set of 20-inch Detroit Steel wheels with Toyo Tires Proxes STIII rubber; AccuAir Suspension E-Level air ride; Slam Specialties bags and VIAIR compressors; Valspar paint over USC body fillers and Steele Rubber Products seals; Corbin Custom Upholstery seats with Rostra seat warmers and back-up camera system; Vintage Air A/C; KICKER sound system charged by a XS Power Vintage battery; Dakota Digital gauges; Con2R steering wheel attached to an ididit steering column; Chad Chriss Chassis Worx suspension; Chevrolet crate 350 with Energy Suspension mounts; Edelbrock TBI intake; JET Chips tuning; Mishimoto cooling system; Russell Performance plumbing; Painless Performance wiring; AIRAID air cleaner assembly; Black Widow Exhaust 250 Venom mufflers; Eaton TrueTrac rear differential; and QuickTrick Alignment tools. 2019 CHEVROLET SILVERADO Air Design USA introduces one of two 2019 Chevrolet Silverado project trucks, this one with a street theme. 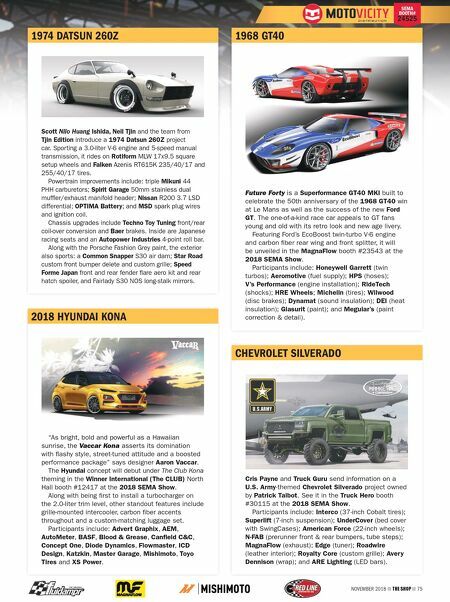 See it in booth #12753 at the 2018 SEMA Show. The lowered pickup features the company's new Street Series front air dam with splitter, side skirts, rear lower spats, fender vents, hood scoop, rear tailgate spoiler and tailgate appliqué. 2019 CHEVROLET SILVERADO Air Design USA introduces one of two 2019 Chevrolet Silverado project trucks, this one with an off-road theme. See it in booth #12753 at the 2018 SEMA Show. The lifted pickup features the company's new Offroad Series front bumper guard, hood scoop, fender vents, door rocker panels, floor liners, rear tailgate spoiler and tailgate appliqué.